Many thanks to the Rensselaer Land Trust for the opportunity to join them, and many municipal, advocacy, agency, and NGO organizations for a tour of the Hudson River waterfront aboard the Dutch Apple. The event kicked off the RLT’s Hudson River Access Plan initiative, supported by the NYSDEC Estuary Program. 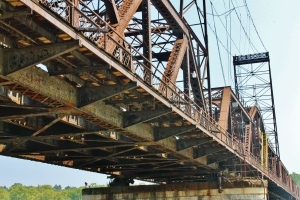 The Livingston Avenue Bridge could be a critical link in connecting recreational assets on both the Albany, and the Rensselaer banks of the Hudson and it is encouraging to be receiving so much support for the initiative to restore bike and pedestrian access across the historic Livingston Avenue Bridge.